A cyclist who travelled 335,500 miles across the world on the same bike only for it to be stolen in the UK is celebrating after it was found. German-born Heinz Stucke bought his bike with distinctive custom-made double handlebars in 1962 to embark on his endless voyage across the globe. It was stolen on Monday as he slept in his tent in Portsmouth just hours after getting off a ferry. It was discovered abandoned on Tuesday in a local park. Mr Stucke, 66, had been given a replacement from Hampshire Police's lost property after officers heard of his plight. He said he was "quite happy" after being informed by officers his bicycle had been discovered abandoned in a local park. Mr Stucke, who was en route to Greenland, survived being stung twice by a swarm of bees in Mozambique in 1995 and a nasty bout of dysentery while in Indonesia back in 1974. 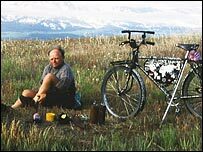 He has travelled to 165 countries and is registered as the Most Travelled Man in History in the Guinness Book of Records between 1995 and 1999. He said: "That bike has sentimental value. In the past I have cycled up to 100 kilometres a day on it. "In the 80s, I cycled to every country on it - it's my way of life, it's the only life I know." Mr Stucke, who has ridden his bike in every continent, now says he wants to focus on exploring countries he has not been to, such as Greenland. "Back in 1962, I was determined to travel and in those days I survived on as little as £1,000 a year for the first 10 years," he said. "All that matters to me is travelling on my bike, that's all I ever wanted to do."